Andrew Johnson came off the bench to rescue a point for Fulham against Wigan who climbed out of the bottom three. Wigan took the lead when Hugo Rodallega lobbed David Stockdale from close range having earlier headed against the post. Damien Duff went close for Fulham but fired against the legs of Wigan keeper Ali Al Habsi when one on one. 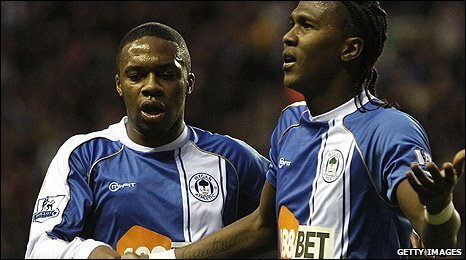 Rodallega's hooked shot was later tipped onto the post by Stockdale before Johnson's late deflected shot from 12-yards beat Al Habsi. The result lifted Wigan out of the bottom three by just a point, but it could have been so much better from Roberto Martinez's side who came agonisingly close to taking maximum points. For Fulham the result also lifts a little of the pressure on them with the Cottagers moving two clear of the drop zone.